RGSL will host a public lecture by Dr. Vasileios Karagiannopoulos on “Hacktivism and the law: The moral and legal challenges of the use of hacking techniques for political expression” on 12 October at 15:00. This will be the first lecture in the public lecture series powered by Ellex Klavins. 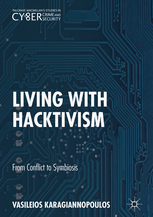 In his talk, Dr. Vasileios Karagiannopoulos, author of “Living with Hacktivism: From Conflict to Symbiosis”, will provide a historical overview of the phenomenon of hacktivism and will analyse the moral and legal challenges presented by the use of hacking methods as a form of political expression. Dr. Karagiannopoulos will discuss the links of hacktivist actions to freedom of expression and civil disobedience and will analyse the legal framework relating to such activities as well as relevant case-law from the UK and the US. Finally, the talk will conclude with a critique of the current approaches to hacktivism and will offer alternative, less conflict-based suggestions for dealing with this complex socio-political phenomenon. Dr. Vasileios Karagiannopoulos is a Senior Lecturer in Law and Cybercrime at the Institute of Criminal Justice Studies (ICJS), University of Portsmouth, where he has been working since 2014. He graduated from Athens Law School in 2005 and in 2007 he completed his LLM in Information Technology and Telecommunications Law at Strathclyde Law School, where he also completed his PhD in Law with distinction in 2013. Vasileios is the director of the Cybercrime Awareness Clinic, a Portsmouth-focused project, funded by Hampshire Constabulary, which aims to increase awareness and build resilience in relation to cybercrime in the local community through public engagement and research. He is also the course leader of the BSc in Criminology and Cybercrime, a new and innovative course which aims to look at cybercrime and cybersecurity from a less technical and more socio-political, legal and anthropological perspective. Vasileios is also the departmental Ethics Committee Chair and Vice-Chair of the Faculty of Humanities and Social Sciences Ethics Committee. He has published on various topics relating to cybercrime laws and Internet politics and regulation and his latest book by Palgrave-Macmillan: “Living with Hacktivism: From Conflict to Symbiosis” focuses on the phenomenon of hacktivism and alternative regulatory approaches.